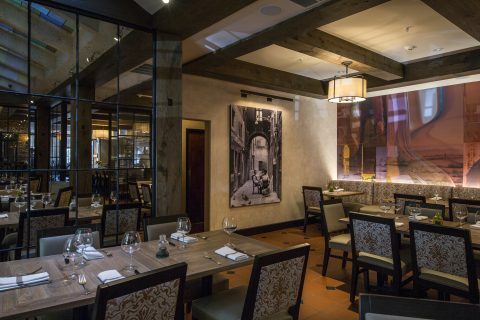 If you are looking to indulge in a classic Italian dining experience and happen to be in Philadelphia’s historic Old City, then Luca Sena‘s Panorama is your place. This restaurant is bringing every bit of authenticity to the Italian lover’s table. Panorama is located in the Penn’s View Hotel, a 51-room boutique hotel that Sena also owns. The restaurant is a consistent favorite and go-to for those looking to experience the authentic flavors of Northern Italy. Panorama prides itself in utilizing the freshest ingredients paired with the over 120 wines by the glass from their unique custom built wine dispensary. New Executive Chef Matthew Gentile has revamped the Italian menu, and recently, Panorama received an overall makeover in September, with their fresh new look of custom Tuscan decor and trattoria-style dining areas. The extensive redesign was completed by internationally acclaimed Marguerite Rodgers Interior Design. Design details including fabrics used throughout resemble fine woven textiles of Italy, with terracotta tones chosen to conjure clay, the Italian countryside and the tradition of Italian pottery. The original polished black granite top was honed to achieve a natural, worn and aged stone finish characteristic of historic Italian homes. LED lights and mirrors were added to the back bar to add sparkle and dimension around the cruvinet/winekeeper and the glass shelves were framed in wood. A mixture of new, custom and antique light fixtures incorporate classic materials including iron, parchment and wax to achieve a modern and current look, including; custom hand- made parchment shades with rawhide –stitching, reinforcing the teams attention to detail, tailoring and craftsmanship. Venetian style shades, made of original Venetian Fortuny fabric were added to simplify existing sconces. 1920’s wall mounted wood and brass sconces with glass hurricanes on gimbaled tops, were blackened and oiled. The ceiling beams were inserted to appear as if they were revealed during construction. The dining room beams are whitewashed while wine bar beams are aged solid oak, which contribute to the authentic natural aesthetic. All doors and windows were replaced with paned glass and iron doors and panels. The original wainscot in the dining room, was glazed to bring new life to the wood. And stitched leather for banquettes in the wine bar was inspired by the existing brick and terracotta tones. The stitched detail reflects a handcrafted tradition of fine tailoring and attention to detail. Sena’s vision creates a romantic, casually elegant, chic environment that feels appropriate for every day dining as well as special occasions. Panorama is most famous for their wine bar, and is purely a wine connoisseurs dream. It is considered one of the best wine bars Philadelphia has to offer, and with over 150 wines by the glass, including vintages, there is sure to be a wine fit for everyones palate. Declared by the The Guinness Book of World Records, Panorama is home to the largest wine preservation and dispensing system in the world. Their selection is unbeatable. Wine selections diversify each week, with over 800 different wins appearing on the menu from an array of regions, styles, and blends. Thankfully for you wine lovers, Panorama offers a signature Panoramic Flights, which is a personal wine tasting offering a sampling of five different wines within a select group from a selection of over 2 dozen combinations. We sampled the Flight #812 M&M’s with Malbec “Mendoza” Trilogie /Fabre Montmayou ’15 from Argentina, Merlot “Trentino” Barone Fini ’14 from Italy, Merlot 90/Cab Sauv 10 “Médoc” Font-Merlet ’10 from France, Malbec “Mendoza” Achaval Ferrer ’13 from Argentina, and Merlot “Napa Valley” Burgess ’13 from California. General Manager William Eccleston masterfully guides guests through pairing options, including the restaurant’s signature wine flight presentation, with iron wine trees custom designed by Luca Sena, among the first in the world to pioneer the flight concept. The restaurant has an in-house cellar, which allows guests to also choose bottles from an extensive reserve list. Panorama serves as a wine destination where aspiring sommeliers and wine enthusiasts taste and learn from the extensive collection. Eccleston also recommended tastings for us of the Cab Franc “Trinch-Bougueil 250 cs prod Biodynamic” Breton ’14 and Carricante/Catarratto “Organic- Le Sabbie dell’ Etna” Firriato ’14. We could not have enjoyed these wines more and were not at all surprised to learn that he was recently distinguished by StarChefs as Philadelphia’s Mentor Sommelier for his commitment to this tradition. Chef Matthew Gentile interpreted Panorama’s stable of recipes, many of which had been in the Sena family for generations, and edited them with modern techniques, lighter ingredients and clean presentations. Chef Gentile kept this in mind when redesigning the menu. Chef Gentile adds a large selection of homemade pastas, large plates for sharing, and many lighter options that can be combined for a meal. Every dish was developed to pair well with wine. Highlights include: Braciola with pizziola sauce and local radicchio; grilled shrimp with white bean croquette, preserved lemon butter and grilled romaine; homemade strozzapretti pasta with wild boar and herb ragu, and aged provolone; and beef carpaccio with arugula arancini, black pepper and bone marrow. Begin your dining experience with Panorama’s Antipasti selection offering small salads such as the classic Caesar, Arugula Salad, and Beet Salad. The most popular of the Antipasti selections include the Octopus, topped with baby arugula and roasted pepper oreganato, and the Burrata, topped with shaved butternut squash, figs, chestnuts, and drizzled with balsamic. Featured on the Antipasti special selection was the tender Wagyu Beef Meatball over polenta. Panorama’s homemade pasta is sure to please your palate. Their pasta courses are offered in both half and full portions. Take it from us, order the full portion, because you will definitely want more and more of their delicate pasta dishes, such as the Gnocchi Gorgonzola, with Anjou pear and black walnuts, and the melt in your mouth Agnolotti con Burrata. These pasta pillows are filled with fresh burrata cheese and topped with San Marzano tomatoes. Other popular and traditional pastas dishes include Fettuccine Carbonara Vegetale, with smoked portobello, duck egg, and parmigiano, and Spaghetti Pomodoro. Each dish on Panorama’s Italian menu celebrates the rich heritage of Italy while reflecting the modern culinary techniques of today. This is most definitely exhibited in their entree selection, which includes their most famous Braciola, made with veal skirt steak, parsley, garlic, parmigiano, porcini genovese, and topped with broccolini, and Scallops with swiss chard, orange-braised turnip, and caper zabaglione. For dessert there is obviously a vast selection of dessert wines to choose from as well as delectable Italian classics like Pera Al Vino with Anjou Pear, moscato, hazelnut-sweetened mascarpone, Bomboloni, and Torta Cioccolato. We tried the Limoncello Cheesecake Semifreddo which is a pizzelle “sandwich,” with basil dolce, and Tiramisu Affogato Budino with banana mascarpone, lady fingers, espresso caramel, and walnut. With so many dishes and drinks to be had, be sure to stop in for happy hour at the Wine Bar on Saturday 3-5 pm and Sunday to Friday 5-7pm. During happy hour specials include: $5 off every wine tasting “flight”, $5 select wines, $4 select beers, $4 off select signature cocktails, and select menu appetizers for half price. This season brings the formal introduction of Executive Chef Matthew Gentile at Panorama. Gentile grew up with an interest in cooking and as a young child helped his family prepare weekly Italian American Sunday suppers at home. The regular tradition instilled a deep passion for Italian food that stuck with him as he developed his culinary talents. He spent his teen years working at small Italian restaurants while he earned a degree in business and philosophy from Penn State. Upon graduation Gentile realized he wanted to pursue a culinary career full time, and worked in various kitchens in West Coast restaurants and Bucks County. He eventually joined the team at Lacroix in The Rittenhouse Hotel where he spent four years. Gentile left to assist Jason Cichonski with opening Ela in Queen Village, and soon was appointed Executive Chef. Gentile then took a position with Starr Restaurants and joined the team at Parc. 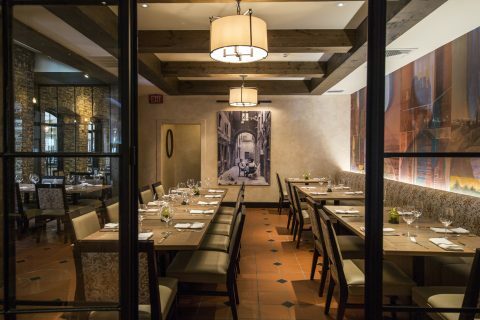 At Parc, he yearned to return to the Italian cooking of his youth, and connected with Luca to transition the restaurant’s first menu overhaul in two decades.